Make your own granola bars with nuts, fruits, and seeds of your choice. 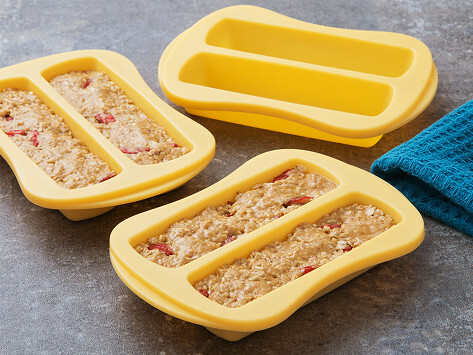 These baking molds can be used with the Tescoma Granola Bar Press or on their own to make delicious baked bars. Granola bar molds are made with heat-resistant silicone suitable for all types of ovens. Dimensions: 3.9" x 5.9" x 1.57"
Great little bags for individually wrapping. 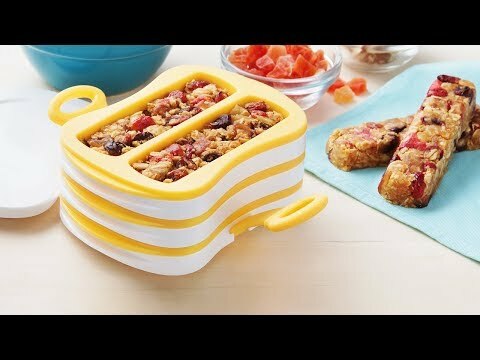 Press nuts, fruits, and seeds into compact bars with this beautifully designed granola bar maker. Tescoma comes equipped with a recipe book, perfectly-sized sealable plastic bags, and three removable silicone molds to make six bars at a time. Once you’ve filled up the molds with your ingredients of choice, you can press and leave them in the fridge for an hour or use the heat-resistant silicone inserts as baking molds. You pick the ingredients and Tescoma does the pressing. The end result is a healthier, gentler-on-your-wallet alternative to store-bought granola bars.